Gav Thorpe is the undisputed master of the Dark Angels. His novel, Angels of Darkness, is still seen as being a seminal piece of Black Library fiction, and has been reprinted at least three times that I know of. Now The Legacy of Caliban series, the trilogy spun off from that first classic tale, has finally come to an end, and it went out with a bang. You can find my review of Ravenwing and Master of Sanctity, the first and second books in the trilogy, at the links provided. Some of what I will be talking about in this review will spoil elements from the first two books if you haven't read them, so you have been warned! The Unforgiven opens up literally exactly where we left off at the end of the last novel. Cypher, the most mysterious and elusive of the Dark Angels foes, has been captured! To be fair he turned himself in willingly after shooting Astelan in the head to save the Dark Angels confronting him. It also turns out that it wasn't actually Astelan who was killed, but a body double of sorts and the real Astelan had given them the slip. Throughout the rest of the book Astelan is mentioned, but we never see him again, so it feels a little unfinished. I'm fine with that character not dying since I really like him, but I guess I'm not really sure what his purpose in this story is anymore. I almost feel like he was really meant to be dead at the end of the second book, but due to either future plans for him, or fans being dismayed at his fate, he was allowed to live at the start of this one. Like I said, he really isn't relevant anymore for the rest of this book, which is disappointing, but hopefully that means we will see more of him in the future. The real meat of this story is the Inner Circle trying to unravel the plans of Cypher and battling with the idea of trusting the arch-traitor. In this novel Azreal gets his moment in the spotlight, just like Sapphon and Asmodai in the last book, and Sammeal before that. To be fair I do feel like this book had more of a shared spotlight, with all of the important members of the Inner Circle getting a decent amount of screen time, but Azreal has to take center stage due to him being the only one who knows all of the chapter's secrets. Some of these secrets are stuff we, as the reader, have always known, while others are stuff that has only been hinted at but never confirmed (until now! ), while at least one big one is a more recent development from the Heresy series finding it's way into 40k. Whenever you are dealing with the Fallen you will have crossovers with the Heresy since they lived through it. After Cypher is captured we actually get a few chapters of the Dark Angels wrapping up the battle they had started at the end of book two before we move onto the story proper. These are okay, but break up the pacing a little bit for me. We do get to see more of Anneal and he gets his own little sub-plot as well as Telemanus. It's nice that these characters that we started out with in Ravenwing get their stories continued and wrapped up. They don't play as huge of a part anymore though, since their main function was to give us the viewpoints of Battle-Brothers not privy to all of the Chapter's secrets and how they react when more is revealed to them as they are promoted. In The Unforgiven all of the secrets are on display for us though, so they are more fan service at this point, not impacting the main story hugely. Although Anneal actually has a huge impact on the story at the end. In fact, it's most likely the hugest impact on the Dark Angels chapter as a whole throughout their entire history. It might even be the biggest event in 40k at the moment, and rivals a lot of the huge events from the Heresy. I won't say what it is, but when you read the end your jaw will be on the floor. The Dark Angels are irrevocably changed after this trilogy. Seriously, nothing will ever be the same again. Knowing their tendency towards secrets though, it may very well be that no one else ever finds out, but we know. Cypher claims to know a sinister plot involving Astelan, Typhus, several other Fallen, and the remains of Caliban and wants to help Azreal stop it. Even after reading the whole story I am not 100% sure what his ultimate plan was, because he is always playing everyone around him. This isn't due to poor writing or anything, it's just that his plan are very complex and I don't know if we will truly find out what they were until a future story...or maybe a past story? The battles in this were all suitably entertaining. The only one that really stood out to me was the final battle, which involves several space marine chapters, Typhus and his Death Guard, the Rock, and the remains of Caliban. Again, this has pretty huge impacts on tons of stuff going forward. It also has some hints at plot points we might see revealed within the Heresy series too, since Typhus and the Fallen are involved. I can't really talk about the second half of the book without giving away a bunch of surprising and entertaining twists. The first quarter of it felt a little slow to me in the pacing department, but that's just due to me wanting to get on with Cypher's plot and instead having to read about Anneal and the battles the rest of the Dark Angels were involved in. They aren't poorly written, and if you're a battle scene fan you'll enjoy them, I personally just like the intimate talking moments more and wanted to find out all of the secrets. If you had read the first two books or are a Dark Angel fan this novel is a must read, no dispute. 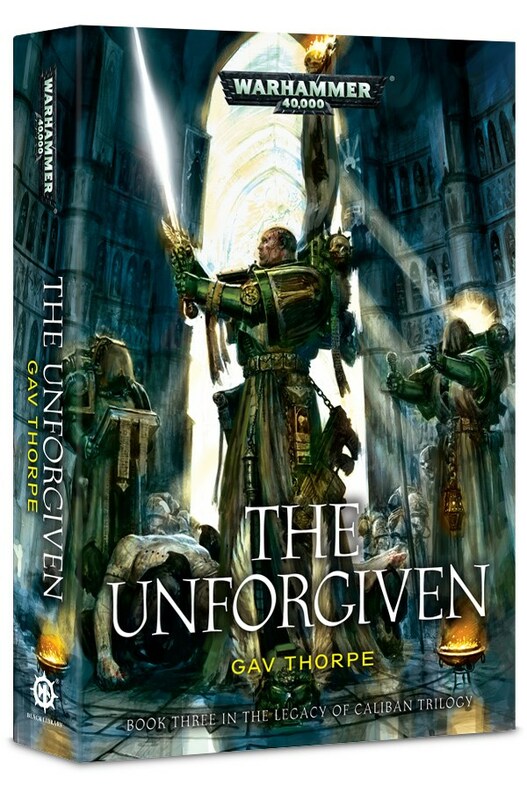 I am definitely looking forward to Gav's first full length Dark Angel book set during the Heresy. It's honestly the book he was destined to write ever since the Heresy started and I have no doubt that he will deliver on our expectations. Little known fact, Grand Master Azreal actually reports to Super Supreme Grand Master Gavius Thorpus, who has lordship over all of the Unforgiven.